Natalie Gehrke at Yacht Marine asks me to spread the news of special charter rates on the motor yachts Serenity II and Nira and I'm happy to oblige. 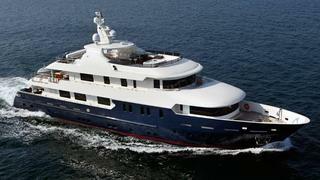 Firstly, the 40m Serenity II is available in Croatia from August 22nd to 30th at €100,000. Accommodating up to 12 guests in a master suite, two VIP staterooms and two double cabins, she's also available from September 16th to November 15th at €95,000 per week. Serenity II is listed for sale on boatinternational.com asking 12.9 million. Then there's the 32.6m Nira, cruising the Greek islands and Turkey from August 22nd to 29th at €49,000. With accommodation for 10 guests in five double staterooms, her daily charter rate from September 16th to November 15th is €6,000. Nira is also listed for sale on boatinternational.com asking €2.55 million.